ABILITY AT COURSE END: The ability and knowledge required to rig, launch and sail a dinghy in lighter winds on calm waters. COURSE DESCRIPTION: This combined RYA sailing course takes you from complete beginner to independent sailor in just 5 days, combining the first 2 elements of the RYA sailing scheme Start Sailing Level 1 and Basic Skills Level 2. Over the 5 days you will learn how to sail independently in all directions, pick up man over board, come alongside pontoons and other boats, how to meet other vessels and launch and recover. Along with essential background theory, our qualified instructors focus on the practical elements of sailing on this course, which is taken in Laser Picos and Bahias in the safe and relaxed environment of Teignmouth bay. 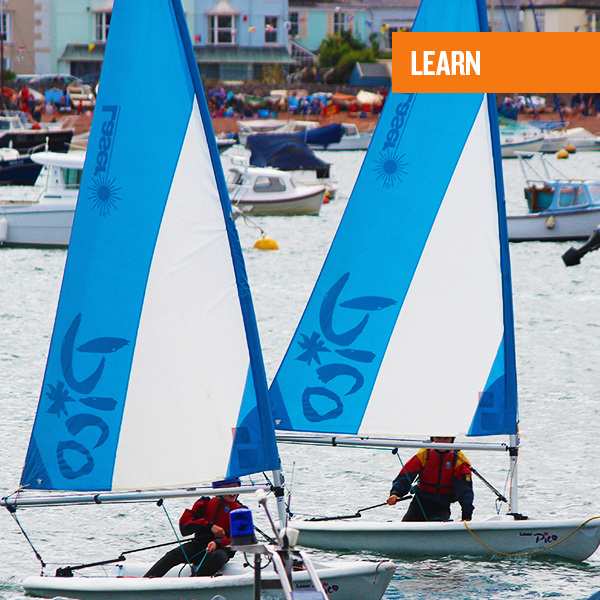 The next step in the National Sailing Scheme is Better Sailing (level 3).